Live Performance CD Released in June 2018!!! The Grace Kuch Band performed at the 2017 Greeley Blues Jam opening the Main Stage. We captured that set and have produced a Live DVD, released in August 2017 and a Live CD released in June 2018! Produced by Colin Bricker at Mighty Fine Productions with the mixing and mastering of the audio! 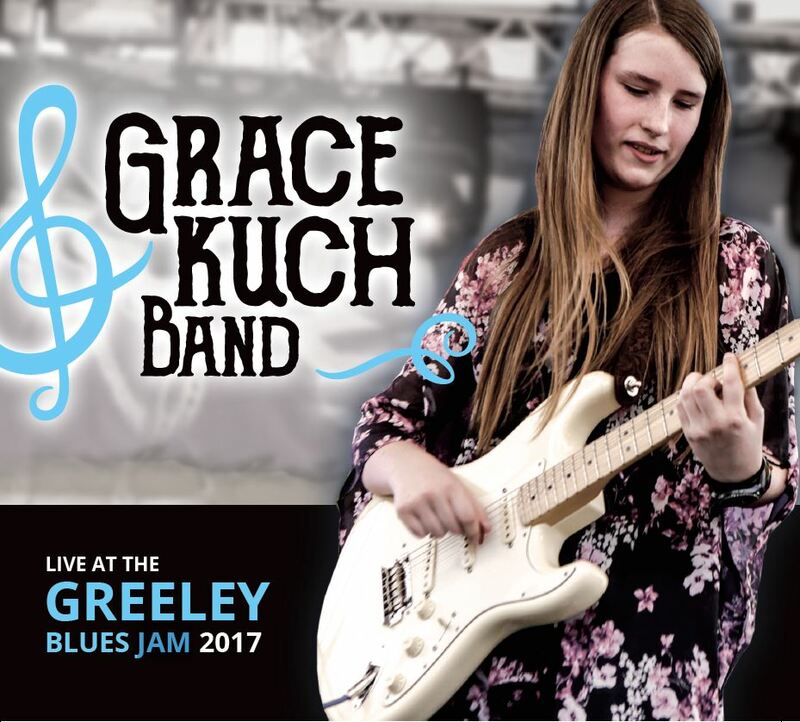 Grace Kuch "Live at the Greeley Blues Jam 2017"
Anyone who has been following the blues scene knows that across the nation every year there are several youths who seem to have a jump on their peers and get promoted as the future of the blues. Right here in Fort Collins we have one young lady that has been making such a name for herself at blues festivals around the country. I think it’s fitting then that Grace Kuch's latest CD is ‘Live at the Greeley Blues Jam’. This record is a jumpin' set of tunes that highlights Grace's blues skills on both guitar and vocals, but it also goes beyond that with tunes that have funk, soul and New Orleans influences. On this recording, Grace augments her quartet with regional celebrities such as Greta Cornett (trumpet) and Jim DeSchamp (guitar). The horn section adds a polish to the sound and the varied soloists keep things interesting from song to song. Grace also employs some cool arrangement tricks such as superimposing the chorus of the popular Delbert McClinton tune “Standing on Shakey Ground” in the middle of the blues classic “Black Cat Bone”. Recorded at The Recordium in Fort Collins, Colorado. by Jasco in May 2015.